Many academics, politicians and legal pundits both within and outside the continent continue to cry loud and frown at the way and manner in which the continent is governed. Africa under watchful eyes of the AU has experienced human rights turmoil of extreme proportion since independence: the 1994 Rwanda genocide, civil wars in Sierra Leon, Democratic Republic of Congo, Somalia, Cote d’Ivoire, Liberia, Darfur, South Sudan, Central Africa Republic to name just a few. It is irrefutable that almost all the conflicts in Africa are fuelled due to the blatant disregard and disrespect of human rights and democratisation. Commentators and advocates of human rights and democratisation in Africa have attracted the attentions of dynamic, articulate and the focused African young elite on the need to reengage the leadership in the promotion and protection of these desirable and universal principles. There is no country that can attain sustainable development without making these concepts as guiding principles; and no country can develop under the atmosphere of conflicts. It is thus a firm belief that, without due regard to human rights and democratisation the chronic conflicts the continent is married to, would be impossible to divorce. 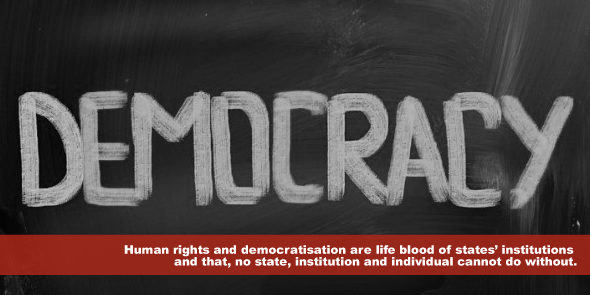 Human rights and democratisation are life blood of states’ institutions and that, no state, institution and individual cannot do without. This is evident in national constitutions which are cited as supreme law of the land. And under the international parlance, they attained the status of jus cogen… meaning cannot be derogated. Therefore, human rights and democratisation are contemporarily implanted in human minds; and disrespect of them would inevitably invite conflict as seen not only in Africa but globally. This is because the principles are as important as the human life. Therefore, the AU must reflect and redirect itself in the promotion and protection of these principles by compelling member states to adhere to them. The development of the continent both economically and politically cannot be feasible without the institutionalisation, domestication and application of human rights and democratisation. In the quest of attaining the socio-economic development of the continent, the leadership in Africa must endeavour to promote and protect these desirable human needs. It is regrettable that the AU has forgotten that this is the only way out. As a result to this the AU was invited to the White House (US-African Summit) and was reminded of these principles that have worked well for United States of America (USA). The status of the USA under the global leadership today is as a result of the institutionalisation, domestication and application of human rights and democratisation in their governance. Therefore, it does not take African leaders to be invited to the White House to attain the development aspirations of the continent. What it takes is to emulate White House good practices (i.e. human rights and democratisation) in the day to day administration of the continent’s institutions. The pursuit of individual interest in the AU is overwhelming. Mediocre leaders continue to militate against the application of human rights and democratisation. They see it as threat or future potential threat to their leadership; and thus continue to nurture, cherish and safeguard selfish interests to the detriment of the development of the continent. Therefore, as far as these issues continue to present themselves; the AU deliberations, the search for peace, development and good governance will continue to be unachievable. Sheriff Kumba Jobe is a 2014 Graduate of the Faculty of Law, University of The Gambia.